I mentioned about Google's intentions to integrate its social applications, to private a feed for all your public activities and an API for accessing your data from external applications. The problem is that you use all kinds of web applications to share different things: you share your favorite blog posts using Google Reader, you use YouTube to upload and rate videos, you post photos on Flickr or Picasa Web Albums, you bookmark web sites using del.icio.us. For each activity, there's a different site that captures your data and does something useful with it. But when it comes to sharing what's important to you with a friend, you need to send a bunch of different URLs and feeds that could change in a year or two when you switch to other services. FriendFeed is a start-up that wants to solve this issue by letting you enter your usernames from different sites and combining all the data in a single feed that could be easily shared with someone. You can also invite your friends and subscribe to their data. The service makes a lot of sense if you use it from a social network like Facebook, so FriendFeed has a Facebook application. 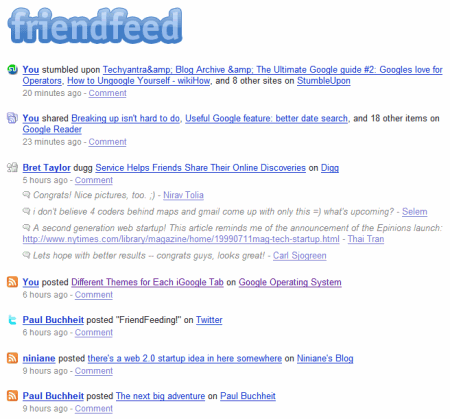 FriendFeed was built by four ex-Googlers: Bret Taylor, Jim Norris (who built Google Maps), Paul Buchheit (Gmail's creator and the man behind Google's motto: "Don't be evil") and Sanjeev Singh. The service launched today in private beta, but you can request an invitation. "This gives you a snapshot of what people you know think is interesting. It's kind of a blog that writes itself," told Bret Taylor to New York Times. And it's really easy to setup the service and collect your shared stuff from different parts of the web. It's interesting to see that Google's former employees continue to do interesting things even after they quit Google. For example, Evan Williams, who co-founded Blogger, works with other former Googlers at Twitter, an innovative micro-blogging tool. David Friedberg, a former business product manager at Google, launched WeatherBill, a site that lets you manage weather risk. I just subscribe to all my feeds in Google Reader and then share the pics/links/tweets that I think might be useful, so everything goes into my google reader shared items. I used feedburner to give it an easier URL. Wink does a similar thing, but it's far from all-encompassing when it comes to social networks. I'll have to take a peek at this one and see if it's any better.